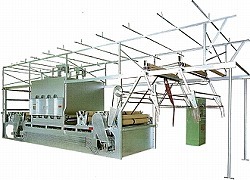 The function of this model is to tighten the knots of the nets by stretching the net lengthwise along with the direct application of steam or electric heat. The stretching ratio and speed can be easily changed by turning the wheel of the stepless speed variator. The static electricity eliminator prevents the net from sticking to the guide rolls. Independently installed temperature controller maintains the present temperature at a constant level for maximum heat-setting efficiency. of electric heat and hot water for all synthetic materials. The variable reduction gear is provided each on the outfeeding (5HP) and infeeding (3HP) side. The pulse generator is also provided on the side of the variable reduction gear to measure the surface speed of the rubber rollers The VS-controller is built in the front panel of the main control box. The length of the net is shown by the on-off type that of set net is programmed by the digital switch. The buzzer is actuated when the set value is reached by an accumulation method. Economical operation is obtainable since power and oil wastes are eliminated with the automatic temperature controller. The heat is generated by the electric current only while the fan is stopped, the heater circuit is also turned off. therefor, the fan motor and the heater can be operated safely. No electric leakage or fire is caused since the integrated electric insulation is provided. Steam is evenly sprayed through eight pipes. 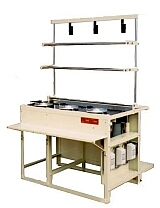 Manual type control system is available upon the request. This heat-setter performs the functions of stretching the net in a depthwise direction, heat-setting the knots, and achieving a good knot-to-knot alignment by use of steam. 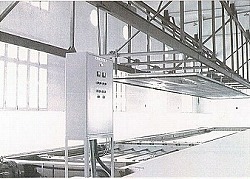 High-pressurized steam delivered from the steam boiler is applied to the net at a temperature ranging from 90C to 100C. This model suits heat-setting a wide range of the nets from fine yarn gill net to extra thick yarn trawl net. Small and medium size machine use a screw drive for the net streching operation and a winch drive system is employed for the heavy duty tyoe machine. 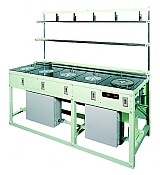 Four models are available depending upon the diameter of the spools, the materials to be applied, and the winding method. *Loading system for double twine can be adopted.